Our aims are to lead campers to a deeper relationship with Jesus Christ as Savior and Lord, to provide enjoyable outdoor experiences, to encourage appreciation of others, to teach new skills and to meet the needs of young people. Shasta Camp Cherith is open to girls who have completed the 3rd through 11th grades. Special programs for older campers are also available. For more information, visit our website or contact Lynn Gallo (650) 712-2114. The camp is at Camp Gold Hollow, located in the beautiful Sierra Foothills near Grass valley. Only a short hike away, along shady trails, there is a creek to explore and a scenic waterfall. The lake is perfect for swimming and canoeing. All waterfront activities are supervised by a lifeguard. Our mature Christian staff will continue to offer girls an unforgettable outdoor experience. From the spartan to the luxurious, there are summer camps for everybody, whether you're looking for particular religious affiliations, outdoor education, sports, or scouting activities. The list below is not complete. For more ideas, check out the websites below. Allen's Guide to Summer Camps. Directory of kids and teen summer camps and travel programs. Summer Camps for kids and teens. Includes traditional camps, academic camps, arts, and travel programs. KidsCamps.com is a great site that categorizes camps by specialties and needs. Whether your child is interested in sports, the arts, science or has special health needs, this is a great site to look at. SummerCamps.com features an easy to use search engine when you're looking for just the right camp. The tables are very informative and well done. Experience the spectacular beauty of the Sierra Nevada Mountains. That's Camp Deer Lake, located in the Tahoe National Forest near Donner Summit! View Devil's Peak as you enjoy your meals in our open-air dining hall. Spend time windsurfing, sailing, canoeing and swimming on two mountain lakes, Kidd Lake and Deer Lake. Sleep outdoors under a blanket of stars and the clear blue sky or tucked in a tipi or platform tent. Adventure programs, two ropes courses, climbing wall, horses, archery range, boats, and an enthusiastic staff are waiting for you. Camp Deer Lake is owned and operated by the Girl Scouts of San Francisco Bay Area with a tradition of providing quality and creative camping opportunities for girls for over 35 years. We also own and operate Camp Bothin, Camp Butano Creek, and Camp Sugar Pine. We also operate Camp Chameleon Day Camp. You do not need to be a registered Girl Scout to attend Camp Deer Lake. All girls entering grades 3-12 are welcome. Summer Address: 17183 Lake Vera-Purdon Road, Nevada City, CA 95959 Phone (530) 265-4460; Winter Address: 401 Amador Street, Vallejo, CA 94590 Phone (707) 643-4573. Email: GoldHollow@aol.com. Camp Gold Hollow is a traditional coed residential camp. Bus Service from Solano and Sonoma Counties. Accredited by American Camping Association. Founded in 1928. Ages 7-17. Girl Scouts. Informal outdoor education program. Activites include canoeing international, archery, rocking climbing, nature exploration, arts and crafts and more. Now accepting camp reservations. Mini & weekly vacations June 25th-August 26th. Camp Sugar Pine is located among the tall sugar pines in the Stanislaus National Forest nestled in the Sierra Nevada Mountains in Calaveras County, California just above Arnold. Sleep under the sugar pines, cedars, bright stars and deep blue skies. Sleeping arrangements will vary from platform tents, dome tents, tipis, tent houses, pitching your own tent or putting up a hammock between two trees. A sparkling swimming pool, 2 riding rings, shady riding trails, a new adventure tower and zipline, bathrooms with flush toilets and showers for each unit and a friendly staff all await the adventuresome camper. Campers will pan for gold in the San Antonio Creek, adventure into the world of nature and science through the Discovery Center, and eat meals in the canopied dining hall. 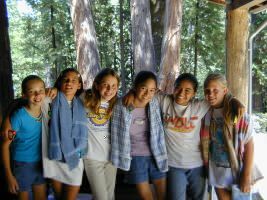 Camp Sugar Pine is owned and operated by the Girl Scouts of San Francisco Bay Area with a tradition of providing quality and creative camping opportunities for girls for over 35 years. This organization also owns and operate Camp Bothin, Camp Butano Creek, and Camp Deer Lake. We also operate Camp Chameleon Day Camp. You do not need to be a registered Girl Scout to attend Camp Sugar Pine. All girls entering grades 2-12 are welcome. Unlimited ages. Day use and overnight camping. Use of all facilitiespool, lake, paddleboats, fishing, hiking. Group reservations only. (530) 389-9614. Located on 160 acres next to Yosemite National Park, at Camp Tawonga campers learn to love the natural world, beome active members of our Jewish community, make life long friends, and discover what's special and wonderful about themselves! Forested setting in Stanislaus National Forest with pool and lake. Accredited by American Camping Association. Featuring: backpacking, arts & crafts, ropes course, drama, singing, dance, climbing wall and more! Coed travel trips for teens, Summer Camp, Specialty Family Camps, and Adult Weekends Interdenominational Jewish, co-ed, overnight camp ages 8-17. Coed, ages 8-14 years. Camp Venture Creek offers an entrepreneurship program along with many traditional activities. Scholarships available. Administered by the Sequoia Council, Chawanake is a summer camp located in the western Sierra Nevadas at Shaver lake, west of Fresno. The terrain is a fir-covered glen with granite boulders on the shore of Shaver Lake. Facilities include boating and swimming in Shaver Lake, as well as rifle and archery ranges, horseback riding, and windsurfing. The campsites have tents on platforms with cots. Some campsites with tepees are available as well. There are showers, and meals are served in a dining hall. The camp has a summer program and is only open during the summer. Located at 7200 feet elevation, cabins sleep six, central bathhouse, lodge for dining, dancing and other special activities. Open June 18 to October 4. Four day August Youth Camps $100.00. Family camp July 12 to August 5. Serves three fine meals a day. Call for information: (209) 937-8099. Administered by the Santa Clara County Council, Hi-Sierra is a summer camp located in an old lumber camp in the Gold Rush country of the northern Sierra Nevadas. The terrain is dense fir and cedar forest with scattered granite boulders. Facilities include a lake with boating and swimming, as well as rifle and archery ranges. Campsites are tents on platforms, and meals are served in a dining hall. The camp has a summer program and is only open during the summer. The Ultimate adventure - an exciting, challenging, wilderness program for teens and pre-teens on Loon Lake near Lake Tahoe. Structured and free choice activities offered: windsurfing, sailing, canoeing, white water rafting, kayaking,rock climbing. Deer Crossing Camp is a traditional coed residential camp. Accredited by American Camping Association. Calilfornia High Sierra lakefront private resident camp for coeds, 9-17. Offering watersports, backpacking,whitewater rafting, rock climbing. Outstanding leadership training programs for 15-17. Founded in 1982. The extensive program here includes lots of amazing horseback activities, along with the usual camp fun stuff. An outdoor adventure for boys and girls ages 6-14 years. Summer Address: PO Box 1348 , Pollock Pines, CA 95726; Phone (415)351-2267. Winter Address: 3717 Buchanan St., Suite 300, San Francisco, CA 94123; Winter Phone: (415)351-2267. Email: mtcamp@mountaincamp.com. Mountain Camp is a traditional coed residential camp, founded in 1968. Located near the beautiful Sequoia/Kings Canyon National Parks, River Way offers 60 activities including waterskiing, mini-bikes, go-carts, wave-runners, ropes course and much much more. A superb pedigreecheck out the website. Activities include Go-Karts, mini-bikes, ropes course, soccer, martial arts, waterskiing, trail rides, riding lessons, English jumping, archery, softball, basketball, badminton, BB-Guns, Frisbee, football, golf, gymnastics, tennis, Ga-Ga, riflery, volleyball, photography, juggling, animal care, arts & crafts, aerobics, hournalism, yearbook production, theater production, cheerleading, boating, digital graphics. At this Christian camp in Coloma (site of the gold discovery that started the California Gold Rush), you'll find whitewater rafting, rock climbing, living history, backpacking, teen challenge trips and much more. Activities include: archery, arts and crafts, astronomy, backpacking, climbing, campfire and evening programs, canoeing, dance, Downieville downhill (You have to earn this one! ), drama/talent show, Frisbee golf, games galore, hiking, horseback riding, horseshoes, mountain biking, mountain boarding, nature education, outdoor living skills, ropes/challenge course, sailing, swimming (pool and lake), swimming instruction (pool), volleyball, water polo, whitewater rafting, windsurfing. For details, please see the special feature at the top of this page. Administered by the Verdugo Hills Council, Silver Fir is a base camp located near Huntington Lake in the western Sierra Nevadas east of Fresno. Silver Fir is a base camp used by troops and posts hiking the Silver Fir Trail and Dinkey Lakes Loop. Units can camp at Silver Fir the night before leaving on their trek to acclimate themselves to the 7,000-foot elevation. Five campsites are available to accommodate overnight camping, and campfire and ceremony programs may be arranged with campmasters. Cost is $5 per scout if using Silver Fir as a base camp (hikers may camp two nights at Silver Fir without additional charge). 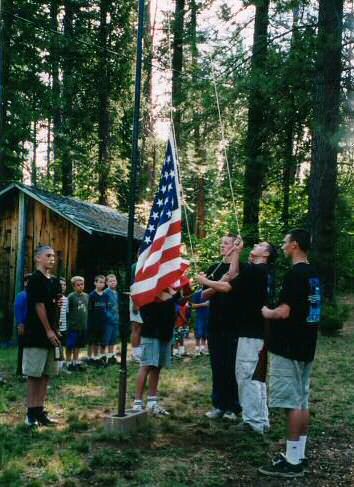 For Scouts staying at camp, it is $2 per night, and families may camp for $10 per night. Reservation are due at least two weeks prior to the trip, and are available online. This camp, in business for more than 50 years, offers an extensive range of activities. (Nevada City) Ages 7-16. Campers choose activities daily; water skiing,horses, crafts, tennis, adventure/wilderness, drama, archery,canoeing, ropes course, BMX/mountain biking. Mature and caring staff. Got a kid who always pushes himself/herself to the limits? This camp may be the answer. Here you'll find bungee jumping, Hummer off-roading, whitewater rafting, glider flights and more. Ages 7-18 years. Horsemanship (Western & English), high adventure, ropes, paintball, air rifles, archery, fishing, .22 riflery, canoeing, backpacking, climbing wall, pool crafts, pond and more! (Grass Valley) Ages 7-13.June 16-30. A healthy and calm environment includes breathing/relaxation exercises, music, drama, dance, swimming, nature, arts, delicious vegetarian meals, Yuba River trips. All this and more. Located at Sivanada Yoga Farm. Yosemite National Institutes (YNI) is a private, non-profit organization dedicated to providing educational adventures in Nature's Classroom to inspire a personal connection to the natural world and responsible actions to sustain it. YNI has a long and successful history of conducting environmental education within America's national parks. We operate through cooperative agreements with the National Park Service in three uniquely beautiful settings: Yosemite National Park, Golden Gate National Recreation Area near San Francisco, and Olympic National Park in Washington. Our instruction is hands-on, science-based and conducted in an advocacy-free atmosphere. We strive to instill an emotional and intellectual connection with nature, which in turn encourages environmental stewardship. Throughout the YNI experience, our students are encouraged and supported by dedicated and knowledgeable instructors who exhibit an enthusiasm for learning and a caring for the individual, to which students readily respond. Students of all ages gain more than just scientific knowledge. They are engaged in challenging activities that teach about interdependence, leadership, critical thinking, diversity, culture, adaptation, history, language skills and civic participation to name a few! Surrounded by a bounty of natural and cultural resources, lessons take on an immediacy that just can't be found in textbooks or television. In short, we make learning fun! f you are between the ages of 11-18, love the outdoors and adventure, we have an exciting summer program just for you! We offer participants a wonderful opportunity to experience the wilderness like never before, make lifelong friends, and have a summer they'll never forget. Please check the website for the offerings. Christian adventure camping for boys and girls. A huge range of activities.